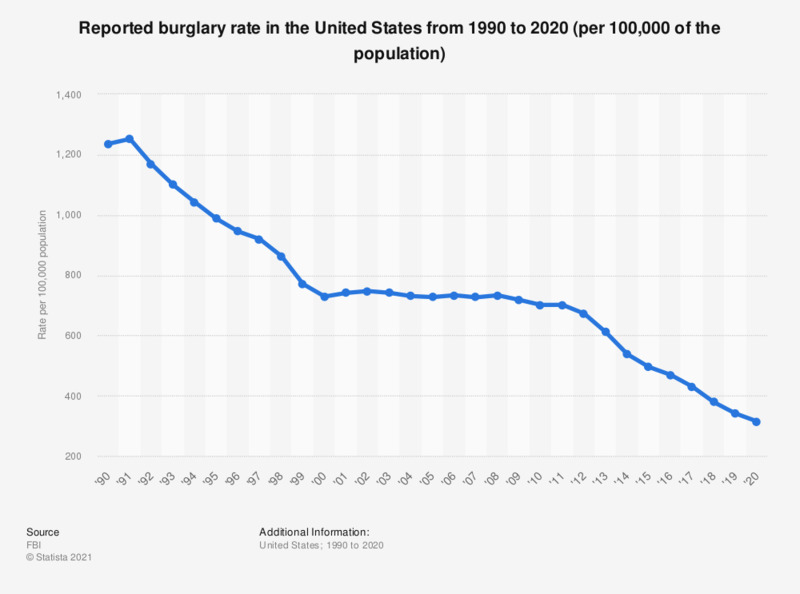 This graph shows the reported burglary rate in the United States from 1990 to 2017. In 2017, the nationwide rate was 430.4 cases per 100,000 of the population. Rates are the number of reported offenses per 100,000 of the population. Unlawful or forcible entry or attempted entry of a residence. This crime usually, but not always, involves theft. The illegal entry may be by force, such as breaking a window or slashing a screen, or may be without force by entering through an unlocked door or an open window. As long as the person entering has no legal right to be present in the structure a burglary has occurred. Furthermore, the structure need not be the house itself for a burglary to take place; illegal entry of a garage, shed, or any other structure on the premises also constitutes household burglary. If breaking and entering occurs in a hotel or vacation residence, it is still classified as a burglary for the household whose member or members were staying there at the time the entry occurred.